Want a display that will act as a USB hub and charge your laptop while it's at it? The best USB-C monitors for photo editing will do exactly this. Welcome to our guide to the best USB-C monitors for photo editing. Whether you’re looking for the best USB-C monitor for a MacBook Pro or MacBook Air laptop, or for a Windows 10 machine, we’ve got you covered. Many of the best monitors for photographers now come with a USB-C port. 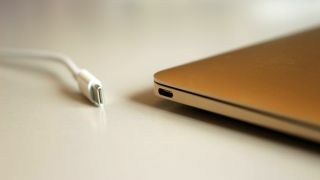 It's an extremely versatile connection that enables you to easily connect up a laptop with a USB-C port – all the more useful now that USB-C is the regular standard for the latest Apple laptops. Right now, we think the best USB-C monitor for photo editing is the 4K LG 27UD88-W, but there are a lot of options out there, at different price points and with different features to consider. Using a single USB-C cable, not only will the best USB-C monitors replicate (or extend) the screen of your laptop, they can also transmit data. This means they can act like a USB hub, so you can plug other USB devices – such as keyboards, mice and external hard drives – into the monitor, and your laptop will be able to use them. Some of the best USB-C monitors for photo editing will also charge your laptop when it's plugged in via USB-C – so you won't need a separate power supply for your laptop. However, not every USB-C monitor supports this, so make sure you check out the features before you buy. Here’s our pick of the best USB-C monitors for photo editing right now. For professional photographers, we think the best USB-C monitor money can buy is the Dell U3818DW UltraSharp. Dell's UltraSharp line of monitors is well known for providing exceptional image quality, and the colour accuracy on this screen makes it ideal for image editing. At 38-inches, this is a very large monitor, but its ultra-wide 21:9 aspect ratio means you get a huge amount of work space, so you can have numerous windows open at once without needing more than one monitor. It's curved, so it's comfortable to use, and its 'InfinityEdge' screen features incredibly thin bezels, which helps prevent this monitor from being too large. If you're looking for the best budget USB-C monitor for professional photographers, then the Samsung LC27H800FCUXEN is an excellent choice, and there's some good deals on it if you shop around (or, even better, use the price comparison tool on this very page). This is one of the cheapest USB-C monitors on the market, but it still has the build and image quality that Samsung is known for. Sure, there are some compromises you have to make, such as the 1080p resolution and lack of ports, but for the price, this is a solid performer that brings the versatility of the USB-C connection to your desk. Aimed at creative professionals, the Asus ProArt PA32UC is a brilliant 4K USB-C monitor for photographers, and it boasts HDR imaging capabilities, and comes in a sophisticated, USB-C and Thunderbolt 3-equipped package with nearly every feature a creative could want for SDR and HDR work. Best of all for professionals, you get a 100% sRGB color space coverage, 99.5% Adobe RGB and 95% DCI-P3; plus pro-grade calibration features and a hardware calibration tool in the box. You can do sRGB-accurate work, wide gamut-accurate work, and HDR work with the PA32UC. There's no getting away from the fact that it is expensive, but if you're serious about image quality, this is the USB-C monitor to go for. The Acer H277HU is another very good budget USB-C for photographers and image editing on. It's got a higher resolution than the Samsung LC27H800FCUXEN, but it's still not 4K, and it's a bit more expensive. But it's a great choice if you want a bit more work space thanks to the higher resolution, while still keeping the price down. It also comes with a HDMI and DisplayPort, plus that all-important USB-C port for connecting your laptop. This is another excellent USB-C for professional photographers, mainly thanks to its incredibly accurate colours, as it covers 100 per cent of the Rec.709 (HDTV) colour gamut as well as 100 per cent of the sRGB colour space, and will even remind you when it's due to be calibrated. It has a stand that allows it to be flipped into portrait mode, which can come in handy if you're editing photographs in that orientation. It also has a built-in USB-C doc that includes multiple standard USB ports, video outputs and even an Ethernet port for internet, making this a brilliant choice for people who have incredibly thin laptops that lack those ports. The LG UltraFine 5K USB-C monitor is the best USB-C monitor for photographers looking for extremely high (above 4K) resolution. Its 5120 x 2880 resolution offers 14.7 million pixels across a 27-inch screen. Photos are breathtakingly rich in detail, vibrant and lifelike, with 218 pixels per inch and a 60Hz refresh rate. It’s aimed at Mac-users, with four Thunderbolt 3/USB Type-C ports on the back. Of course, any laptop with a USB-C port is supported, but be warned that it doesn't have any other video inputs, so if your laptop doesn't have a USB-C port, this minimalist monitor won't be for you. The HP Envy 27 is a stunning 4K USB-C monitor with sleek aesthetics, thanks to its micro-thin bezels. While it's aimed more at gamers, like other devices in HP's Envy line, it does an excellent job providing 4K visuals and USB-C functionality for a very decent price. It delivers rich colours and excellent image detail, but you'll need to do a bit of tweaking to the default settings to get this monitor looking the best. If you're a professional photographer who needs spot-on colour accuracy, then this might not be the best USB-C monitor for you, but for anyone looking for a stylish 4K moniutor with USB-C, then this is definitely worth considering. The Acer XR382CQK's 38-inch display, complete with AMD’s FreeSync technology, makes this the best USB-C large screen monitor. It comes with an ergonomic stand with height, tilt and swivel so you can easily adjust it to make it comfortable to work on and there’s also the normal arrangement of eye-protecting features like an anti-flicker mechanism and a blue light filter. While colour accuracy isn't as spot on as the BenQ PD2710QC, if you want a USB-C monitor to make presentations on, or just love working with a large screen, then this is the one for you. If you're after an ultra-wide USB-C monitor to make use of that wider screen size (so you don't need multiple monitors on a desk, for example), then the LG 34UM69G-B is definitely worth considering. It's more affordable than other 21:9 USB-C monitors on this page, mainly because it has a lower resolution. This means you don't get as much space to work on as higher resolution monitors, but you still get that ultrawide aspect ratio. Meanwhile, out-of-the-box colour accuracy is good, with strong grayscale performance. This is a brilliant budget USB-C monitor for the price.